The tournament is a two-day stroke play event flighted by handicap with tee boxes set up for senior players (50+) to enjoy competition with players of similar ability. 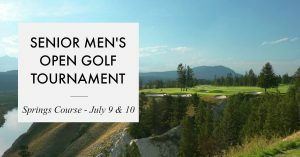 Entry fee includes two rounds of golf, range balls, gross & net prizes, burger & beverage on day 1 and wind-up buffet luncheon on day 2. Carts are not included in fee. Please email or call Paul Buccini booch@telus.net 403-819-9840 for registration forms or any questions.